The summer of 2012 is the time of my life about which I feel most nostalgic. They were the final months of my school career, a school at which I’d been at for almost a decade, with many of the same people – people that I’d lived with, cried with, cried with laughter with, studied with, and perhaps most importantly drunk tea with. They are the people who have seen me at my best and the people who have seen me at my worst. Consequently these few months not only represent a whole load of fun but the end of an era, an era which I admit I have perhaps slightly struggled to let go of. This picture in particular was taken at our final prefects dinner – perhaps one of my most memorable evenings at school – and it’s just one of the glimpses into my time there. 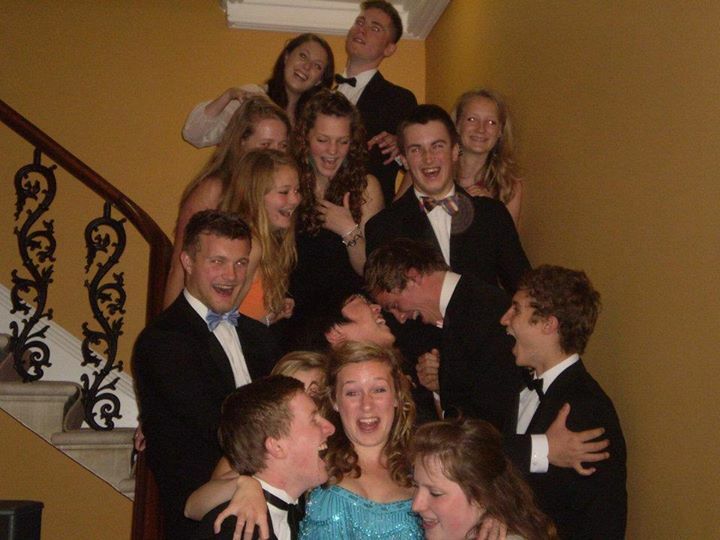 We had had a fancy dinner, as was protocol in sixth form, and it had turned into (somewhat tipsy) dancing. The puffy red faces and disheveled hair are a result of this and I guess the fact that none of us actually look that great despite the black tie (sorry guys) reminds me what a good time we were having. We couldn’t care less about what we looked like. What I really love about this photo is that it captures not only the night, but so much about those months, and my time at school. I can’t remember what was so funny, and yet it doesn’t matter because so much of my time with these people was spent in laughter. Looking back on those months the sun seemed to always be shining, the sky blue, the birds singing – you get the picture, but since an online weather log contradicts this, I imagine this is just a side effect of nostalgia. It wasn’t the weather which made that summer seem brighter than it was but the people, the parties and the coming together of a friendship group. And in all honesty, it doesn’t matter which photo from that time I’d chosen; the joy with which the memory of that summer fills me is encapsulated in so many snaps, with so many different people, in so many different ways. Thanks to all of you were there for being part of that time. It was, what can only be described as – a perfect summer. I read this article and found it very interesting, thought it might be something for you. The article is called A Perfect Summer – #photographicmemory and is located at http://prancingthroughlife.com/2014/02/24/a-perfect-summer-photographicmemory/.